The controversy over the disposal of nuclear waste has been an important issue in Taiwan for decades. Since the demand for electricity is increasing, constructing the fourth nuclear power plant in Taiwan has become a dispute as well. The people living on the island are concerned not only with the safety of the nuclear power plant, but also with the government management of the nuclear waste. Taiwan has 6 reactors at three sites currently, and since 1982 the radioactive waste has been transferred to Orchid Island which is located in 65 kilometers off Taiwan's coast. Residents on Orchid Island protested against storing the nuclear waste on their homeland. The major issues of this topic are the conflict between te Taiwanese governemnt and poeple living on Orchid Island, and great debates over the constrution of the fourth nuclear power plant in Taiwan. There is an important dilemma surrounding the nuclear question in Taiwan. Nuclear power constitutes a large part of Taiwan's electricity. However, the nuclear waste generated has posed a great threat to the Taiwanese people and their environment. Are there any alternatives to replace the nuclear power plant? Perhaps,oil,coal,gas, and hydroelectricity could provide electricity instead. Another question also is whether there are costs in terminating the nuclear project. Due to the current energy situation, it is possible that the electricity price will increase, foreign investment will decrease, and domestic economic growth will fall. The conflicts raised by the nuclear dump dispute will be the bases for the case study. In 1982, the Taiwan Government built a nuclear waste dump to store nuclear waste from Taiwan's nuclear power plants on Orchid Island. The Tao's health and the environment of Orchid Island have been seriously threatened by the poisonous nuclear waste. It is said that the workers on the nuclear waste sites permit the dumping of radioactive and polluted water into nearby seas where the Tao people do their fishing. It is likely that the increasing number of cancer-related deaths and children who have been born with defects is related to these contaminated fish. The Tao people feel that Taiwan's government neglects their human rights. Therefore, the Tao people have protested that they want to defend their homeland by removing the nuclear dump from Orchid Island. The level of conflict is low while the impact of the conflict is noticeable. The construction of the fourth nuclear power plant (NPP4) is debated because of the Tao tribe's protest and the rising antinuclear campaigns by environmental groups. Tao tribe's protest has mobilized environmental groups to organize their own anti-nuclear campaigns. Consequently, the government has halted the construction of the fourth nuclear power plant. The decision to continue construct the fourth nuclear power plant on Taiwan's northeast coast has become a significant political, economic and environment issue for Taiwan. In addition, the government is trying to find a permanent site for nuclear dump outside of Orchid Island. Taiwan's nuclear reactors are all threatened by natural disasters, such as earthquakes, typhoons, and volcanic activities. While there are six reactors on the small island, maintaining these nuclear reactors to operate safely has high priority in Taiwan's environmental issues. These low level nuclear wastes have stored in the trenches on Orchid Island (Lan-Yu) since 1982. The Taipower continues to transfer nuclear wastes to the island. This has raised residents' concerns about their health and environment, causing more protests against the nuclear dump. Moreover, the nuclear dump issue also involves in the construction of the fourth nuclear power plant on the northeast shore of Taiwan which has raised great debates on the government's nuclear power policy. The conflict spread from the Orchid Island to the mainland Taiwan. The anti-nuclear movement spread from Orchid Island to mainland Taiwan where there is a growing debate. The Taiwanese government chose Orchid Island as the nuclear waste storage in the 1970s; however, people on the island did not receive adequate information. Since an Orchid Island resident wrote an article to question the nuclear dump in 1985, the issue has been taken seriously by the Orchid Island residents and people in mainland Taiwan. More articles and reports have appeared in the newspaper and on TV. The residents on Orchid Island started their protests , which attempted to stop the Taipower company from sending more nuclear waste to the islet. In 1987, an organization, Yamwei Tribe Young Generation Union (YTYG), was set up to organize a series of anti-nuclear movements by the Orchid Island people. The most successful protest formed by the Orchid Island people was the 530 anti-nuclear movement in 1993. The impact of this demonstration was that the Legislative Yuan froze the financial budget for the second stage of construction of the second nuclear waste field on the Orchid Island. At the same time, many environmental groups began to support the protestors who requested that the Taipower company and the government to remove the nuclear waste from Orchid Island. Furthermore, the nuclear dump issue on Orchid Island involves the debate over construction of the fourth nuclear power plant. Since the nuclear power plant is generating nuclear waste, people think that it is necessary to cease building any nuclear power plants in Taiwan. Environmental groups and organizations have propagandized the slogan of " A Nuclear- Free Homeland. " The fourth nuclear power plant dispute has caused bickering among politicians. In 1990, the Legislative Yuan approved the building of the fourth nuclear power plant, in order to avoid the power shortage in Taiwan. The opposition party (Democratic Progressive Party, DPP) at that time requested the government to reevaluate construction of the fourth unit. In 2000, the Opposition party's leader, Chen, Shui-bian, took control of the government. President Chen announced that the construction on Taiwan's fourth nuclear power plant will be halted. The new opposition parties (Kuomintang, KMT) required a thorough reassessment of this decision of construction the fourth plant. The Cabinet argued that the cancellation of the project will not result in the shortage of electricity. In addition, the Cabinet stated that disposing nuclear waste would be a tough problem to solve. Lastly, any nuclear accident would a huge crisis for Taiwan because Taiwan is a small island with a large population. Because of the continued struggle between the Cabinet (DPP) and the opposition (KMT), debates over the construction the fourth nuclear plant is ongoing. After the Judicial Yuan ruled that the Cabinet had made a procedural flaw in halting construction, the construction of the fourth nuclear power plant resumed in 2001. However, the officials stated that the Chen administration still regards a nuclear-free home as the ultimate goal. The Cabinet is planning to hold a referendum which will attempt to halt the construction of the fourth nuclear power plant. 1978 Taipower first proposed to build the NPP4 in the KungLiao Valley of Taipei County. April, 1985 55 Legislators signed an emergency petition to the Executive Yuan requesting a reevaluation of the necessity of construction of NPP4. 1986 Budget for the NPP4 project was frozen in the Legislature Yuan after the Chernobyl accident. 1988 The first anti-nuclear movement was held in Orchid Island. Oct. 3, 1991 One police office died and ten people were injured in an antinuclear demonstration. June 1992 The Legislature passed the budget for NPP4. 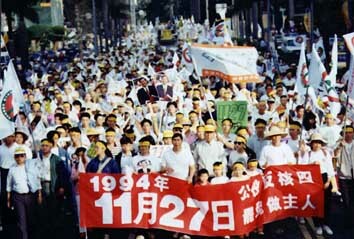 April 26, 1992 3,000 people joined the anti-nuclear demonstration in Taipei. June3, 1992 The Legislature Yuan passed the budget for the fourth nuclear power plant (NPP4), despite the opposition. 1994 The Tao came to mainland Taiwan to protest against nuclear dump on Orchid Island. May 25, 1994 The first referendum was held within 35 km range of NPP4. Voter turnout was 58%, 96% were against the NPP4. Nov.27, 1994 The second referendum was held. Voter turnout was only 18%. 89% of the people were against. Mar.23, 1996 The third referendum was held. Voter turnout was 59%. 52%of the epople were against and 46% of the people were for. May 24, 1996 The Legislature Yuan passed a bill to abolish all nuclear power plant programs. Oct 18, 1996 The Legislature Yuan overturned its previous decision and announced that the construction of the NPP4 will be continued. Dec. 5, 1998 The fourth referendum was held. Voter turnout was 44%. 64% of the people were against and 36% were for. Mar. 27, 2000 Presidential candidate, Chen, Shui-bian claimed that he will stop construction of NPP4. 2001 Construction of NPP4 was resumed. 2002 More than one thousand inhabitants of Orchid Island participated in the anti-nuclear demonstration which was called the exorcism movement. They called on the President Chen Shui-bian to fulfill his 2.000 presidential campaign. Any nuclear leak from the nuclear waste will be a fatal damage to people who live on Orchid Island. The nuclear waste will also pollute the Pacific ocean. Most people live at the coastal area of Taiwan earn their living by fishing. Therefore, the contaminated water and fish will indirectly injure their health. It is also likely that the contaminated water will float to Japan, the Philippines and other neighboring countries and cause profound damage to the region. The Tao people are concerned about the fish they eat. According to a Tao human rights campaigner, he said that the death rate from the cancer has increased significantly. In addition, children were born with defects in many cases. In 1993, a number of deformed thornfish were first found in the thermal outlet of the second nuclear power plant in northern Taiwan. News reported that a fishman found this kind of deformed fish near the sea off Orchid Island as well. This has raised the Tao's concern about their health. The scientists found that high temperature caused the deformed thornfish. Although there is no clear links between the deformed fish and nuclear power plant, people think that the high temperature water is from nuclear power plant and therefore resulted in the deformed fish. The Taipower has not come to a resolution to solve the nuclear dump on Orchid Island. The nuclear waste is still being storied there. The Taipower proposed a new plan which will move another nuclear dump site from Orchid Island to another Taiwanese islet, Wu Chiu, 5 km of the southeast coast of China. Wuchiu, Kinman and Maysu serves as three frontline military bases of Taiwan. The Taiwanese government began to dispatch troops to Wuchiu islands since 1952. Nowadays, there are 500 Taiwanese troops stationing there. 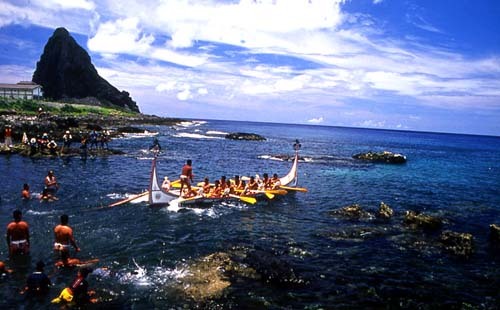 Wuchiu is comprised of two major islands of Tahchiu and Hsiaochiu. The total land of Wuchiu is 1.22 square kilometers with a population of 387. Since the Taipower company choose Wuchiu as a permanent nuclear dump site, residents of Wuchiu opposed this plan. Despite an offer of $99 million as compensation, residents of Wuchiu still reject to have a nuclear dump in their homeland. There are many variables that complicate this plan. For example, China opposed this plan because the nuclear dump site is possible to pose a potential threat to China’s offshore environment. In addition, the islet, Wu Chiu, is very close to China and China can therefore easily attack and seize it in the case of war. In 2002, Taipower announced that the plan of construction of the permanent site for storing nuclear dump will stop. However, the scarcely populated Wuchiu Islandsr remain Taipower’s first choice for building the site. In sum, the people of Taiwan are in great conflict with the building of a nuclear dump anywhere in the country. It seems that the Taipower will have difficulties finding an ideal location to store nuclear waste for Taipower. (1) Allan Mazur and Beverlie Conant, "Controversy over a Local Nuclear Waste." Social Studies of Science, Vol. 8, No. 2, May 1978, pp.235-243. (2) Todd R. La Porte, "Nuclear Waste : Increasing Scale and Sociopolitical Impacts." Science, New Series, Vol. 201, No. 4350, pp. 22-28. (3) Tony Allison, " Taiwan : More Than Just a Nuclear Controversy." Asia Times, Nov. 2000, http://www.atimes.com/reports/BK01Ai01.html. (4) Keith Bradsher, "Nuclear Dump Distrust a Peaceful Taiwan Island." The New York Times, 2002. (5) "A History of the Radioactive Waste Crisis in Taiwan." http://archive.greenpeace.org/comms/no.nukes/waste02b.html. (8) "Nuclear Power Earns Fresh Look, despite Past Woe " USA Today, April 17, 2001. (9) "Nuclear - Free Asia, Support Taiwan ." Greenaction, http://www.greenaction.org/nonukes/index.shtml. (12) Taiwan Ministry of Economics Press Release, Sep.30 , 2000. (14) Min,Shen Ouyang,"Nuclear Power Development in Taiwan:Operational Performance and Prospects. "JAIF Annual Conference, Japan, 15 April, 2003. (15) Gloria Kuang-Jung Hsu, "Problems and Current Status of the Fourth Nuclear Power Plant in Taiwan."